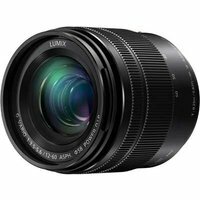 Panasonic's weather-sealed Lumix G Vario 12-60mm f3.5-5.6 lens (35mm camera equivalent - 24-120mm) is a versatile zoom capable of smooth, silent operation for both high-speed stills and 4K video work, thanks to an inner focus drive system, stepping motor and the camera's quick, high-precision AF system. Great for travel and built for Micro Four Thirds, the lens provides a maximum aperture opening of f3.5 at the wide angle and f5.6 at the tele end, as well as Panasonic's Power O.I.S. (Optical Image Stabiliser) which compensates for the effects of camera shake.